Time flies. 2014 is coming to an end and 2015 is approaching. At this turn of the year, I wish to extend my best wishes to people of all ethnic groups in China, to our compatriots in the Hong Kong and Macau Special Administrative Regions, to our compatriots in Taiwan and overseas Chinese, as well as to friends in other countries and regions in the world. 2014 is unforgettable. During the past year, we have pushed forward reform with strong determination, cracked many hard nuts, and introduced a string of major reform measures, many of which are closely related to the interests of the general public. We have adapted to the new normal of economic growth, actively promoted economic and social development, and brought about further improvement in people's lives. On 12 December, the first phase of the central route of the South-North Water Diversion Project went into operation. More than 400,000 people along the route have been relocated. We pay tribute to them for their selfless contribution, and wish them a happy life in their new homes. In the past year, we have endeavored to improve our work style and strengthen party and government discipline, with efforts focusing on fighting against formalism, bureaucracy, hedonism and extravagance. The situation has greatly improved. We have stepped up the fight against corruption and punished corrupt officials with a zero-tolerance attitude, which demonstrates our commitment to fighting against corruption and other evil forces. In the past year, we have enhanced our cooperation and exchanges with countries around the world. We hosted the APEC Economic Leaders' Meeting in Beijing. Our leaders have visited many countries and received many foreign leaders. These exchanges of visits have helped the world understand China better. Officials at various levels have spared no efforts to perform their duty. Of course, those achievements would not have been possible without the support of the people. I would like to give a "thumbs up" to our great people. During the past year, we have established the Victory Day of the Chinese People's War of Resistance against Japanese Aggression, the Martyrs' Day and the National Memorial Day for Victims of the Nanjing Massacre through legislation. These new memorial days included many solemn events. Despite the change of times, we would always remember the sacrifice and contribution of those who gave their lives for the Chinese nation and for peace. During the past year, we have also experienced some sad moments. Malaysia Airlines MH370 went missing. The whereabouts of more than 150 of our fellow countrymen remain unknown. We have not forgotten them. We will continue to make all possible efforts to find them. During the past year, our country has also suffered from a number of major natural disasters and work safety accidents, in which some compatriots lost their lives. The Ludian earthquake in Yunnan Province claimed more than 600 lives. Our hearts are with them and we wish their families well. The New Year bell is about to ring. We will continue our efforts to act upon people's expectations and turn their aspirations into reality. We will continue to deepen reform in an all-round way. An arrow that has been released makes no turning back. At this critical moment of our reform process, only those who brave hardships would prevail. We must advance the rule of law in an all-round way, and use the rule of law to guarantee people's rights and interests, uphold social equity and justice, and promote national development. For the goal of building a moderately prosperous society in an all-round way to be completed in due course, comprehensively deepening reform and strengthening the rule of law must go forward hand in hand, like the two wings of a bird or the two wheels of a car. The living standards of the Chinese people are constantly improving, but we should always keep in mind those who are still living in hardships. We will work with passion to improve their well-being, with efforts focusing on poverty alleviation and guaranteeing basic living conditions. We will provide assistance to all those in need of help, including poverty-stricken farmers and urban residents with difficulties, so that their basic living conditions are guaranteed and their hearts are filled with warmth. We will continue to comprehensively strengthen party discipline, and unswervingly improve our work style. We will always resort to anti-corruption as a sharp weapon, and consolidate mechanism-building as a cage to contain powers. In this socialist country led by the Communist Party of China, any corrupt official who is exposed must be dealt with. All those involved in corruption and embezzlement must be prosecuted and punished. We are now pursuing a lofty mission. Only perseverance will lead to victory, while giving up halfway will lead us nowhere. Our blueprint is ambitious, but our task is arduous. All party members and people of all ethnic groups in the country must stand united. We must pool our wisdom to seize opportunities, work together to embrace challenges, tackle problems with quick action, and carry on innovation with determination, in order to make China a better country year by year and constantly improve people's living standards. 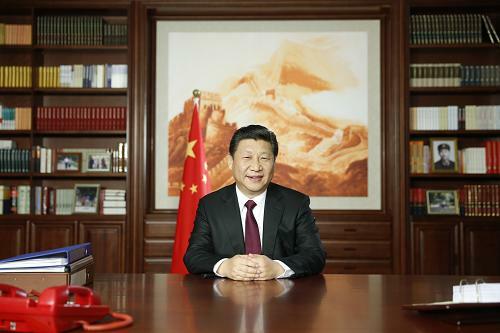 The Chinese people care greatly about the country's future and the future of the world. When Ebola emerged in Africa, we offered our help. When a water shortage occurred in the capital of the Maldives, we provided assistance. There are numerous examples like these which demonstrate the spirit of common destiny of the Chinese people and all humanity. The world is not yet a tranquil place. We long for peace and we sincerely hope that people of all countries can work together to ensure that all humanity will be free from the suffering of hunger and all families free from the threat of wars, and that all children can grow up in the sunshine of peace.